I can't believe it. A most trusted entity, Walt Disney, has been filling our children's heads with lies. 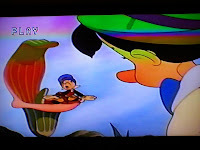 Imagine my surprise when watching Pinocchio today with my son, there, in front of my face was THIS! I know. You're probably as surprised as I am. There is Jiminy Cricket, atop a pitcher plant (aka Genus Sarracenia for those in the know). Everyone knows that the outer rim of the pitcher plant is slippery. A cricket would have an extremely difficult time balancing thusly. Additionally, the sweet nectar and intoxicating drug that is a pitcher plant's secretions would surely force a cricket to leap excitedly to its death past the peristome to the pitcher tube, where this carnivorous predator would slowly dissolve Jiminy's body into dinner (though not the exoskeleton- these just pile up). But, being an open-minded individual such as I am, I'm willing to give Disney the benefit of the doubt. Maybe Jiminy is immune to the lure of the coniine. Fine. Maybe Jiminy's shoes deftly withstand the perilous footing of the waxy deposits on the trap entrance. Maybe this particular plant is absent of the "window", an area lacking chlorophyl so insects believe they can fly through the plant, and instead bump into the operculum and fall to their deaths. I'm a reasonable person here. But clearly, here, we see another fallacy. Jiminy has eluded death in unimaginable ways. You see, the pitcher plant is a master predator to an insect: the smell (some smell strongly of cat urine for example), the sweet nectar, the intoxicating drug, the false window, the slippery edge. Should the insect fall into the pitcher tube, it is met with many many down-pointing hairs against which it cannot gain footing. It would be forever trapped! In these scenes, Jiminy is seen repeatedly popping into and out of the plant, finally exitng into a dry, faunally-diverse landscape. Neither does the pitcher plant live in a dry habitat, nor does it live among many other species- they are found in nutrient poor habitats and swampy areas. AND the final nail in the coffin- Pinocchio is set in Italy. Pitcher plants are found only in North America, exclusively. Could you please send some of the drugs you're taking over to me? You're sounding like a guy I used to know in the 60's.